This situation motivates growers to optimize production methods, utilizing all resources including manure. In addition, an increase in the price of commercial fertilizer experienced since 2009, has heightened interest in the use of manure for supplying crop nutrients and has significantly increased the value of manure as a nutrient source. Estimates of the economic value of manure are important in comparing manure application rates and methods, valuing manure for off-farm sale, budgeting new facilities, and evaluating contract livestock production opportunities. 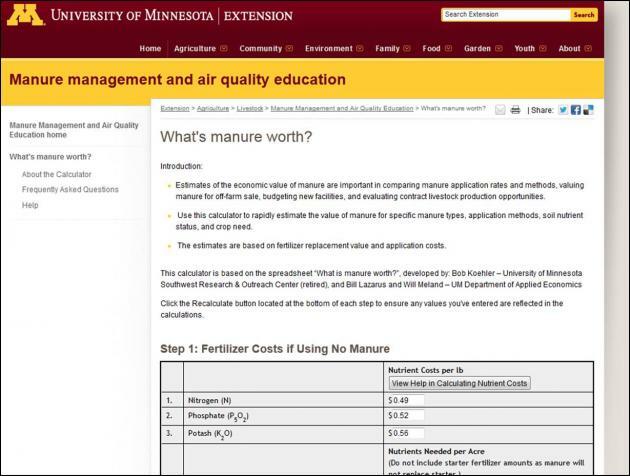 The University of Minnesota has developed a free calculator to rapidly estimate the value of manure for specific manure types, application methods, soil nutrient status, and crop need. The estimates are based on fertilizer replacement value and application costs. The manure economic value is calculated as shown below. In Step 1, enter current fertilizer (if using no manure) and N, P, K, and micronutrients needs for the crop. In Step 2, choose the manure source, amount and nutrient content, and application method. Step 3 considers some final adjustments such as second year benefits, tillage saving and yield boost impact.